This section is about a batch of twenty so called 'Vertriebslagerloks', that we will call stock locomotives from now on. Between 2008 and 2011, Siemens (slowly) built a batch of twenty stock locomotives. It started with 189 800 for MTEG and 189 700 and 701 for Cargo Trans Vagon from Rumania, followed by another 17 units in a white base livery. The first three white units, designated E 189 801, E 189 840 and E 189 820 were decorated with Siemens promotional logos and markings, similar to those once applied on former test locomotives E 189 929. The remaining 14 machines just got a white base livery and a black frame. The ones with Italy in their base package (sub type VE, 189 82x) got a red front surface. The idea is that Siemens can serve customers with small orders on the short term with these machines. In the near future, the Siemens Vectron will offer the same possibilities, but it still will take years to get this new platform approved and working in all the countries where the ES 64 F4/189 is already welcome. MRCE Dispolok was the first to purchase Siemens E 189 stock locomotives. In June 2011, Siemens delivered E 189 840-844, all repainted in black, to the leasing company. You would almost forget about them, but Siemens still owned two ES64F4 locomotives that have been used on temporary basis over the past years, be it for tests, or for renting out to customers. The Steiermarkbahn operated the 822 until 2017, the 823 was used by CFI in Italy and last seen as test locomotive in Germany and the Netherlands. Now both engines reportedly have been added to the fleet of DB Cargo. Unexpected, but not unlogical. DB Cargo has one of the largest fleets of machines of this type (90 in total) so the company has extensive experience with the two newbees. One thing is different though, the 822/823 have a different country specific package (version VE DE/AT/CH/IT/NL(SI-HR)) compared to the DB machines (VJ NL-DE or VM-50Hz DE-PL-CZ). It is not known to us if this will change in the (near) future. The white 189 822 and 823 are the last two unsold units of batch of 20 electrics that were built in 2009-2011. Machines from this production batch were sold to MTEG (1), WLE (1), Locon (2), CTV (2, Romania), Express Group (1, Slovakia), PKP Cargo (1) and MRCE (10). Exotic: Steiermarkbahn 189 822 visited the Netherlands on 29.04.2016. This machine is officially not equipped for running in NL. It came and went in a car train to Vlisisngen-Sloehaven. Vectron 193 902 is currently making trial runs on the Hanzelijn (Reinhard Abt). Update: Siemens 189 823 does not support today and was left behind in Lelystad. 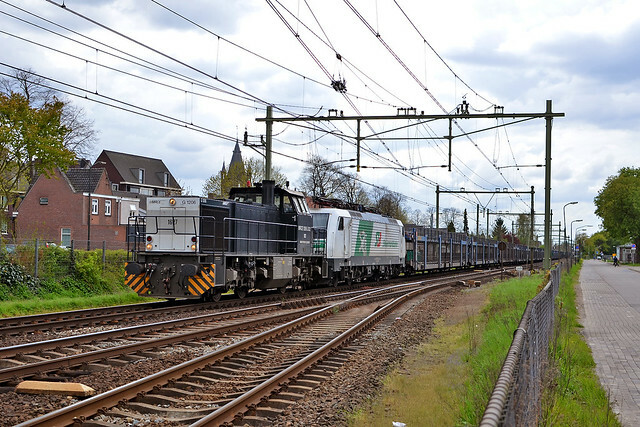 Vectron testing in the Netherlands continues. Yesterday and today, the Siemens 189 823 assisted. Thanks Jeroen de Vries en Wilco trumpie. There are three EuroSprinter locomotives left, that are still property of Siemens: 183 717 and 189 822 and 823. But not being sold, does not mean these machines are not being used. These recent images show 183 717 in a CargoServ train. Both 189 822 and 823 are being hired to operators that have recently ordered new Siemens locomotives. 189 822 will be replacaed by 183 717 in 2015 in the fleet of Austrian operator Steiermarkbahn. 189 823 is now in service of Italian operator CFI, that will get tewo Vectron locomotives in the second half of 2014. In the beginning of 2015, Siemens will delivered a second ES 64 U4 type locomotive to Steiermarkbahn from Austria. It is the second locomotive of this type for this operator, which wants to use it for long haul freight services. This new 1216 961 is the very last locomotive of its type built by Siemens. Currently it is still used by the manufacturer as machine no. 183 717. This year it will be used for various ETCS testing. On 31.12.2013, the locomotive was first photographed with new logos. The newest testbed locomotives in Italy are not very active. We have not seen any dynamic trials with 191 001 yet. The EuroLight prototype 284 002, that arrived in Italy in 2012, has made its first run only today. Siemens stock locomotive 189 822 arrived in Italy on 12.09.2013, but was parked in Chiasso ever since (which resulted in this nice tricolore line-up btw). After completion of the tests, the locomotive returned to Germany. update: Yesterday, 189 822 and 823 ran through Germany together. At the end of the day the stopped at Dresden. The two remaining Siemens 189 series stock locomotives, 189 822 and 823, were seen in the Czech Republic (CZ) last week. Check this image. Update: The two white machines were transported to the VUZ Velim test center. Their presence in CZ is part of this project. For anyone still interested: Siemens still has three 189 series locomotives for sale: E 189 845, 822 and 823. All three were present during the day, parked next to a black one: ES 64 F4-995. In Wegberg, Siemens has several locomotives used for shunting. The have PCW numbers. PCW 6 is a red Vossloh G800BB, PCW 7 is the EuroRunner and the EuroSprinter godfather is now PCW 8. The question however still remains, will PCW 8 ever run again? For two years now, the machine is parked in Wegberg, have some sort of damage... PCW 7 presented itself in two different sizes. However, the model was a silver scale locomotive, with small inkjet-printed paper logos and graphics. A long waiting queue was there all day. Everybody wanted to climb into Vectron 193 922, parked outside. We did not go in, but made some nice close-ups of the exterior and some impressions. Again a tip for everyone looking for works numbers (193 924 = SMP 21697) of Siemens locomotives: go to cab no.1, check the frame right above the right buffer. Good luck! Around fifteen HLE 19 series locomotives were seen in Wegberg. The 1909, 1906 and 1913 were in front of the public. We took the opportunity to make some good close-ups of 1906 and its Schwab-coupler system, that what makes the HLE19 different from its normal HLE18 sisters. Also note the special steel, futuristic construction behind it. Today, the black E 189 802, E 189 803, and E 189 804 have left Berlin-reinickendorf, hauled by hvle diesel-locomotive V 160.6. The three black machines then run from Berlin-Ruhleben to Nürnberg, together with the white E 189 845. Most likely, PKP has bought this locomotive, so it can return a rented to locomotive to MRCE. This however is not fuly confirmed yet. Siemens Mobility is to supply five type ES 64 F4 Eurosprinter locomotives to the leasing company Mitsui Rail Capital Europe B.V. (MRCE). These locomotives will be equipped for use in Central and Eastern Europe and be certified to operate on long-distance routes from the Black Sea to the Baltic ports in Poland and to the Dutch border. 2010-10-22 [DE/NL] more stock 189s from Siemens are coming..
[DE/NL] more stock 189s from Siemens are coming..
First you see a blue painted EuroRunner derivate to be delivered to the RAI, the railways of Iran. It's a 2400 kW, single cab diesel unit.